Read about the women who changed the landscape of science: from pioneers of the ancient world to super-scientists like Marie Curie to unlikely geniuses, such as Hedy Lamarr, and much more. 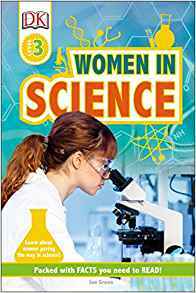 Women in Science includes scientific pioneers who came up with incredible ideas that changed the world; women who work in the fast-paced world of technology; amazing engineers who build incredible structures; and mathematical geniuses. Perfect for 7- to 9-year-olds starting to read alone, Level 3 titles include in-depth information presented through more complex sentence structure with increasing amount of text to expand the reader’s general knowledge and confidence in reading. Additional information spreads are full of extra facts, developing the topics through a range of nonfiction presentation styles, such as fliers, instructions, and record-breaker statistics. Trusted by parents, teachers, and librarians, and loved by kids, DK’s leveled reading series is now revised and updated. With shiny new jackets and brand-new nonfiction narrative content on the topics kids love, each book is written and reviewed by literacy experts and contains a glossary and index, making them the perfect choice for helping develop strong reading habits for kids ages 3-11. About the Author: Dr Jen Green is a writer and editor mainly specializing in geography, history, nature / environment and social issues. She also writes on science, human body, survival, art and artists. She has written over 250 published books, mostly for children aged 5-15 but also for adults. Jen received her doctorate from the University of Sussex in 1982. She worked in publishing for 15 years, as an editor and later editorial manager (1981-1996) and has since worked full-time as a writer and editor. Her book ‘Your Feelings: I’m Special’ was short-listed for the NASEN Special Needs Award.